On Monday March 12, 2018, Meir Flancbaum, Psy.D. 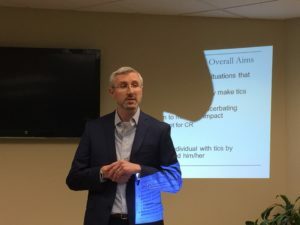 presented at the quarterly meeting of OCD New Jersey (OCD NJ). Dr. Flancbaum is a clinical psychologist and director of the Center for Cognitive Behavior Therapy in East Brunswick, NJ, where he provides therapy, school-based consultation services, and professional development workshops focusing on the evaluation and treatment of children and adolescents with a variety of social, emotional, and behavioral difficulties. Dr. Flancbaum has expertise in the evaluation and treatment of Tourette syndrome and related conditions, including obsessive compulsive disorder, trichotillomania, anxiety, and disruptive behavior disorders. In addition to his clinical practice, Dr. Flancbaum is Clinical Assistant Professor and Coordinator of CBT Training for the Child Psychiatry Fellows in the Department of Child and Adolescent Psychiatry at Rutgers Robert Wood Johnson Medical School, where he was awarded Teacher of the Year by the fellows in 2016. Dr. Flancbaum presented a case example of a 13 year old boy who presented with motor and vocal tics, obsessions, and problems with paying attention. He was diagnosed with Tourette syndrome, as well as OCD and ADHD. 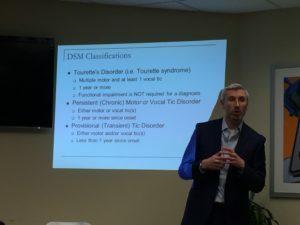 Dr. Flancbaum explained it is very common for someone who has been diagnosed with Tourette’s to have other comorbid disorders (ADHD, up to 50%, OCD, 30-40%). The “tic matrix” was explained as the following: motor tics – a) simple examples: eye blinking, shoulder shrugging, neck jerking, and abdominal tensing. b) complex examples: hand gestures, facial contortions, jumping, echopraxia (imitating others’ gestures), and copropraxia (inappropriate gestures). Vocal tics – a) simple examples: sniffing, barking, throat clearing, and screaming. b) complex examples: single/ partial words/ phrases, repeated use of words, echolalia (repeating others’ words), and coprolalia (saying inappropriate things, occurs infrequently). Characteristics of tics include 1) severity tends to wax and wane, 2) start by the face, then move to the rest of body, 3) may be less during focused activity, 4) may be exacerbated by stress, excitement, or fatigue, 5) may impair social, academic, and occupational functioning, and 6) often preceded by a premonitory urge. According to Block et al. (2006), tic severity is worst at ages 9 and 13. 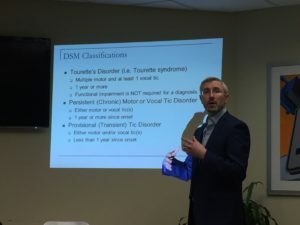 Dr. Flancbaum outlined the diagnostic classifications for Tourette’s syndrome, persistent motor or vocal tic disorder, and provisional (transient) tic disorder. Approaches to tic management include the following: 1) the understanding that there is no cure for tics, but there are proven management strategies, 2) cognitive behavioral therapy which involves a) habit reversal training, b) assisting with related challenges (e.g., how to talk to peers about tics), and c) co-occurring disorders, 3) medications, and 4) school based consultation and in-services. Habit reversal training (HRT) is a scientifically tested, theoretically grounded behavior therapy. It works for children through adults, is goal oriented and time limited therapy (10 weekly sessions, can be more). The behavioral perspective points out that a person with tics doesn’t have to engage in the tic behavior after an urge, which will lead to a decrease of the urge over time (habituation). When the person engages in the tic behavior, he/she experiences temporary relief which fuels the urge cycle. HRT works for people who have frequent or intense tics, report significant stress or interference from the tics, motivated to decrease tics, willing to put time and effort into therapy, and willing and able to tolerate temporary discomfort. Behavior therapy for tics includes: 1) psychoeducation, 2) HRT: awareness training, competing response training, and social support, 3) function-based assessment and intervention, and 4) relaxation. Awareness training is a description of the tic, a description of the urge before the tic, and practice noticing when the tic occurs. Competing response (CR) training provides the person with a behavior that is incompatible with the tic, easily done, and socially acceptable. For example, a CR for a vocal tic = controlled breathing, mouth movement = gently purse lips, and eye blinking = controlled blinking. Dr. Flancbaum gave an interesting and informative presentation, followed by a thorough question and answer period with the audience. DVDs of this presentation are available through the OCDNJ website. All DVD titles from previous meetings are available on our website, www.ocdnj.org. Dr. Rachel Strohl is a licensed psychologist at Stress and Anxiety Services of NJ in East Brunswick. She is on the Board of Directors at OCD New Jersey. She may be reached at 732-390-6694.